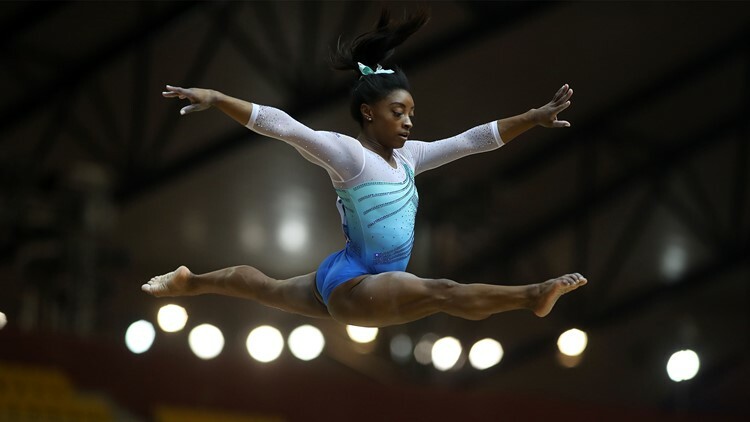 US' Simone Biles competes in the women's all-around final of the 2018 FIG Artistic Gymnastics Championships at the Aspire Dome on November 1, 2018 in Doha. Simone Biles fell twice, but her huge advantage in degree of difficulty carried her to the gold in Qatar. DOHA, Qatar — Simone Biles is human after all. Oh, she won the all-around title at the world gymnastics championships Thursday, as expected. That’s four, by the way, more than any other woman ever. She also extended her winning streak, which began at the U.S. championships in 2013 and includes the Rio Olympics, where she won four gold medals, including the all-around. But this was far from her best. Biles fell twice, on vault and balance beam, and put one foot out of bounds on her first tumbling pass on floor exercise. But her huge advantage in difficulty carried her to the title. She finished with 57.491 points, 1.693 points ahead of Japan’s Mai Murakami. Morgan Hurd, who won the world title last year while Biles was taking time off, won the bronze medal. Even with the mistakes, it was Biles’ largest margin of victory at the world championships. Only her victory in Rio, by 2.1 points, was bigger. When the total flashed on the screen, Biles’ eyes widened and she broke into a relieved grin. 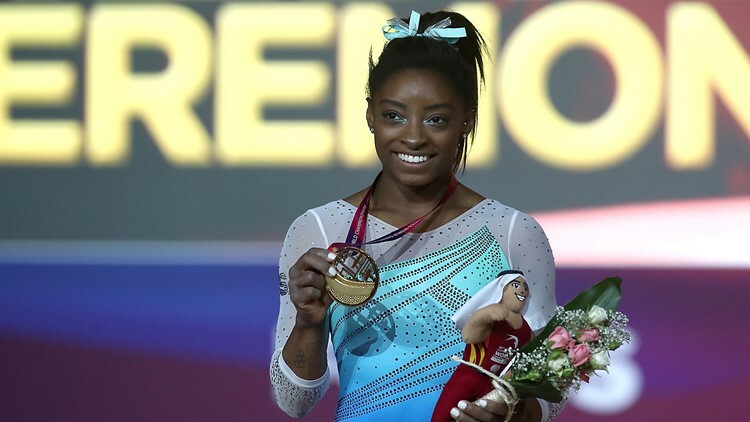 Simone Biles of the US poses for a photograph with her gold medal after winning the women's all-around final of the 2018 FIG Artistic Gymnastics Championships at the Aspire Dome on November 1, 2018 in Doha. Biles is so dominant, so athletically superior, the joke has been that she could fall two or three times and still win. She proved that Thursday, where she was clearly not her best. Whether it was the kidney stone that kept her in the emergency room until 1 a.m. the night before qualifying, the expectations or simply a bad day, Biles wasn’t herself from the start. She opened with the vault that is now named for her, a roundoff with a half-twist onto the vaulting table and then a front double full somersault off. It’s so difficult even some of the top men don’t bother trying it, and Biles’ left arm appeared to slip on the table. That kept her from getting enough height on her somersaults to pull off her landing. She landed on the very backs of her heels and fell backward onto the mat, drawing a gasp from the crowd. Because of the vault’s difficulty, however, she scored a 14.533, which left her in third place. Biles rebounded with a monster routine on uneven bars, previously her “worst” event. She was aggressive throughout, flitting from bar to bar like a hummingbird. She got so high on her double twisting-double somersault dismount she might have changed a light bulb or two, though she was slightly crooked on her landing. Still, her 14.725 moved her back ahead of Hurd. On balance beam, she fell on a front aerial somersault with a half twist, her left foot landing on the edge of the beam. She tried to save it, but couldn’t and had to jump off the beam. She also had a big wobble on her front piked somersault, where she had to grab the beam during the team final, and looked awfully close to the edge of the beam on her dismount. She was clearly furious as she climbed off the podium, not reacting when coach Laurent Landi put an arm around her shoulders as encouragement. But she carried a 0.092 lead into the final rotation, and there’s no one who comes close to her acrobatics or sass on floor exercise. She got so much power on her first pass it carried her briefly out of bounds, but the rest of her routine was flawless. By the end, Landi was clapping his hands over his head. Biles was smiling as she climbed off the podium, champion once more.